Explanations in German, modern and clearly presented and equipped with high-quality illustrations for easy understanding. The Sport-Tiedje Kettlebell exercise poster presents instructions for Kettlebell workout according to latest sports-scientific knowledge. The Sport-Tiedje Kettlebell exercise poster illustrates exercises for different muscle groups, freely to choose. 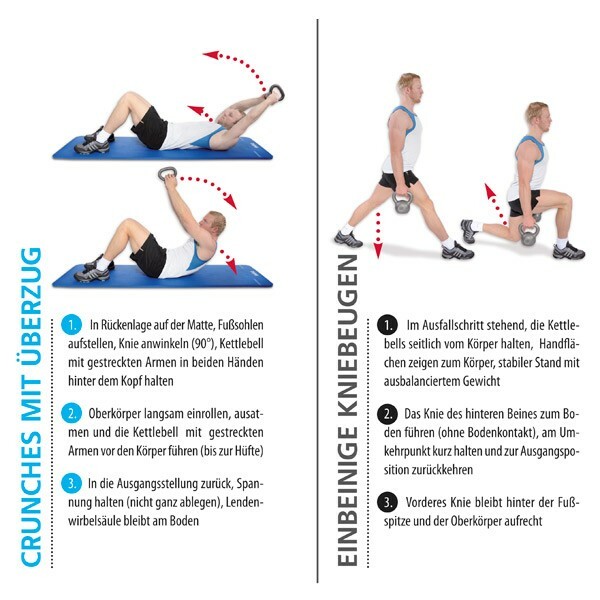 The workout instructions for the Kettlebell include high-quality colour illustrations as well, demonstrating starting and finish position of the Kettlebell exercise. The Sport-Tiedje Kettlebell exercise poster is good for beginners as well pros. All in all, the Sport-Tiedje Kettlebell exercise poster presents 24 Kettlebell exercises. The range of exercises includes biceps curls to whole body exercises like "straight swinging". The Sport-Tiedje Kettlebell exercise poster helps to build effectively muscles and shows correct accomplishment of Kettlebell workout.